Property Size 1,141 sq. ft.
Gorgeous GULF VIEW unit in Tops'l Beach and Tennis Resort!! 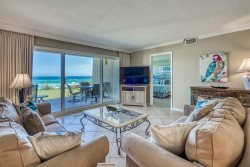 Tops'l Summit 610 is a two bedroom, two bath condominium in the Summit building with views overlooking the Gulf of Mexico and Tops'l Preserve, and just an easy three minute stroll to the beach. Tops'l is a beautifully landscaped paradise resort, popular year around, with private security, several resort restaurants, numerous clay tennis courts, and free shuttle service around the resort. Summit guests have their own private swimming pool, outdoor BBQ grill area, and organized family activities. Located across the highway from the resort is Baytowne with its many restaurants, entertainment, shopping and summertime fireworks displays. Summit 610 is a 6th floor unit with spectacular patio views of the gulf and preserve. Inside, the family room has a smart TV with DVD player, cable TV and free WIFI. The two bedrooms sleep 6, with a king bed in the master bedroom, and a queen bed and twin-over-twin bunkbeds in the guest bedroom. Each bedroom has a full bath. The entire unit has been completely upgraded with new flooring, countertops, kitchen island and seating area, and master bath tiled shower with whirlpool spa. Tops'l Summit 610 is the perfect family getaway: a luxurious condominium steps away from the gulf, with the latest in updates and amenities, located in the most beautiful resort in the area! Add $130 for housekeeping and 11% for tax. There is a $69 damage protection fee, $30 booking fee, and 2.2% fee to process credit card payments. A deposit of 25% holds the unit for you and is applied toward your final payment.